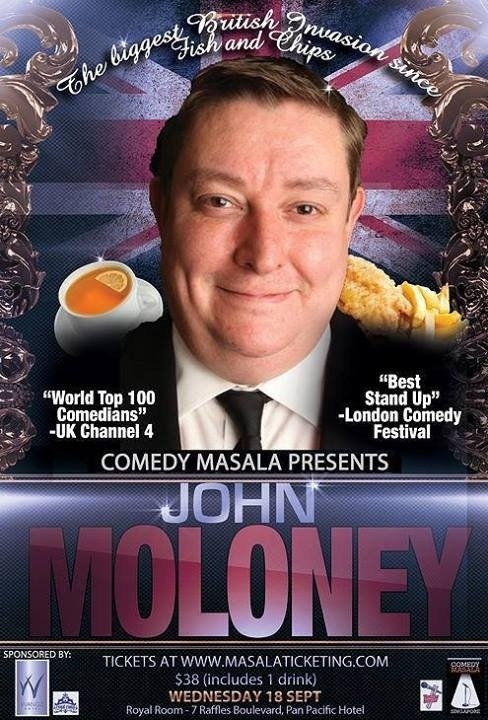 Comedy Masala presents John Moloney. Well, I had no plans last Wednesday night and I was pretty prepared to just head home after work. Maybe even sleep three hours earlier or something. But thanks to City Nomads, I got myself a pair of tickets to my first stand up comedy show ever! I was really excited since I had no idea what to expect. Would I like it? How does it work? My curiosity caused many questions to pop into my mind during my train journey. When I got to the Royal Room of the Pan Pacific Hotel, I was pretty surprised to find the cosy bar semi-filled. I was always under the impression that Singaporeans just watch television shows or work overtime on most Wednesday nights. With a complimentary glass of white wine and munching on a small bowl of fries, the audience enjoyed two stand up comedy acts by Nat Baimel and Es Hill before John Moloney took the stage. I really enjoyed myself throughout the 90 minute event. It was more than lame jokes and puns, proving stand up comedy to be more tough than I originally thought. One thing I really loved about the event was that all three comedians had such different ways of working the stage and making the audience laugh. The variety was refreshing and kept me engaged. Baimel played around with accents of different nationalities and people stereotypes that are associated with the accents. Hill, on the other hand, chose to make fun of himself and share with the audience a part of himself that was lighthearted and funny. As for Moloney, he reacted a lot to the environment around him and it was amazing how he weaves his act so seamlessly with his real time reactions during the event. Considering that the performance was his first time in Singapore, I felt that he was brave. I mean, different crowds laugh at different things. His comedy act may work in London but it may not work here. Who knows. He took a risk, definitely. But throwing himself out there and showing such confidence on stage, the audience reacted warmly and received his acts well. I guess his sincerity and charisma drawn people in. For me, I appreciated his style of sharing his jokes. It took me a while to get used to it since his act was different to the kind of humour we have here in Singapore, but when I got it, they were funny. I laughed the night away and gave all three comedians the applause they definitely deserved. Stand up comedy is no easy thing to do and witnessing it live with my own eyes, I can definitely appreciate it better now. And understand why this craft is still here today, why people are willing to give generously to enjoy such a performance and why comedy clubs should exist. I am grateful for such a wonderful experience.